DPMI Colombia was to be my one last trip abroad through MIIS during my time in graduate school, and I jumped at the opportunity to try a DPMI program, and it being conducted in Latin America made it extremely attractive. I had, to an extent, avoided classes that were project management-based because I believed that it wasn’t going to be necessary or particularly valuable for my career. But after doing a Saturday morning design thinking workshop, I realized that this type of program can stretch and challenge my abilities, and push me to think further outside of my very small creativity toolbox. I had few to no expectations, having never been to Colombia, and never engaged in a workshop such as this, nor done much work on program design. Furthermore, it being conducted entirely in Spanish, I knew it was going to test that ability as well. I’m pleased to say that the workshop itself exceeded and feeling or subconscious expectation I had had. I was surprised to see the diverse backgrounds of the participants in the workshop, with only seven being from MIIS, there were over 30 participants from Colombia, and from around the world. This diversity was instrumental in creating the environment for necessary conflict to truly understand that notion that “development is hard.” Indeed, the program design process we learned challenged every level of thinking, forcing us to erase “common sense” and start anew, asking questions, thinking, and, most importantly, listening to our fellow participants. While our classes and group work at MIIS can be challenging and fun, this program took us outside the walls and put us face to face with an international community such as that we may encounter in our careers. My classes from in policy, migration, and (importantly) conflict resolution all came into play during this workshop. 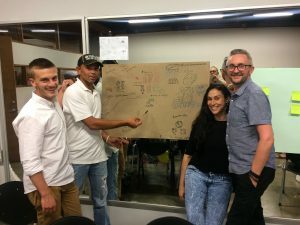 I’m happy to say that my current internship in Costa Rica has required the use of the very tools we learned during the workshop in Medellín, including the Spanish vocabulary in program design and development. The client project with Sanynco was less successful on my part, as I felt that I and the client were both unprepared with regards to expectations of me, as well that the viability of the project they had in mind, Sumak Kawsay. While what I submit for my deliverable is meager, it is a reflection of the struggle in making this particular project work, and the ability to complete such a project without constant one-on-one time with the client, of which there was very little opportunity during those two weeks. I do believe that, along with what I submitted, the client went back to reexamining their goals and perhaps starting with smaller projects that may help build their connections in the communities they seek to assist, as well as with government officials and lawmakers needed in order to make their worthy vision a reality. Team Huellas con Dignidad and analyzing the problem of disappearing and polluted mangroves, as well as dignified housing, in Rincón del Mar, Colombia.